Romper, Sweet Vivi and the #NSale. Happy TGIF Everyone! It is a Good Friday indeed - the #NSale is here, the biggest Nordstrom sale of the year. First of all, isn't Vivian's outfit so cute? And she looks adorable in it, too. 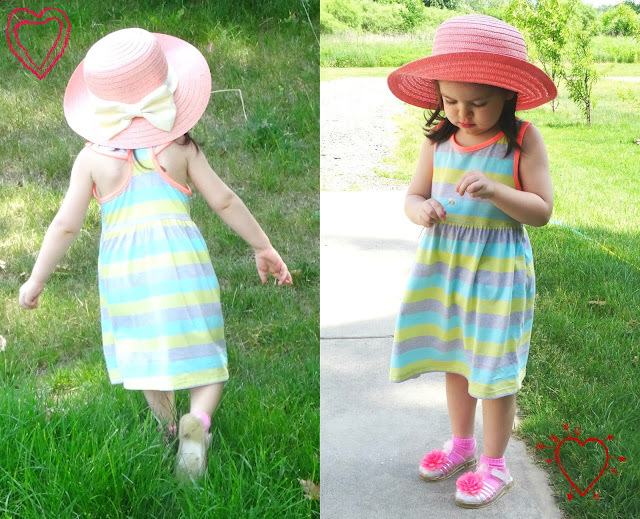 I love her Neon Colorblocked Striped Dress in Heather Gray, Yellow, Mint and a Coral Trim. The back of the dress is so cute and mimics the cute back (with the large bow) of that Pink Hat she loves and loves to wear (which is mine). My flower child (she loves picking, smelling and being surrounded by flowers) has on the most adorable Clear Lucite Sandals too which have neon pink chiffon flowers adorning them. And myself - I am wearing a Cute Babydoll Blue Romper embroidered in a white floral motif. This Bohemian-Style Romper is light and airy for a hot Summer day, especially a casual day running errands, being paired with Simple (rubber) Flip-Flops. I have been all about the blues this week (evident here and here) so why ruin a good thing? After all I love blue, especially for Summer. I dressed it up a bit with a pop of red via my Long Beaded Necklace. 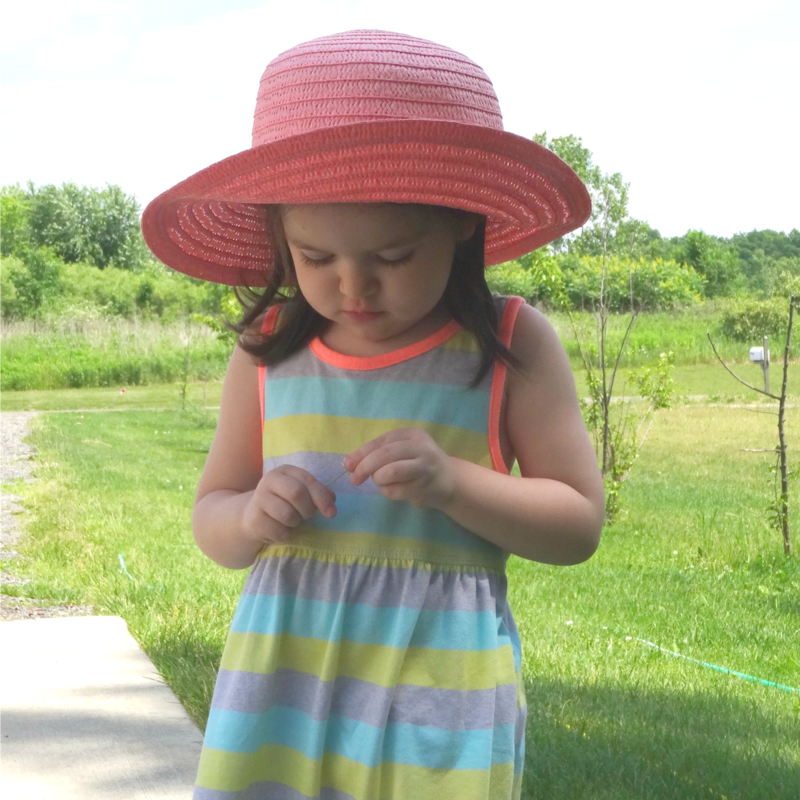 But let's be honest, my sweet Vivi steals the show in today's post. ;-) Come back here on Monday and check out how I styled the Pink Bow Hat that Vivi is wearing today. 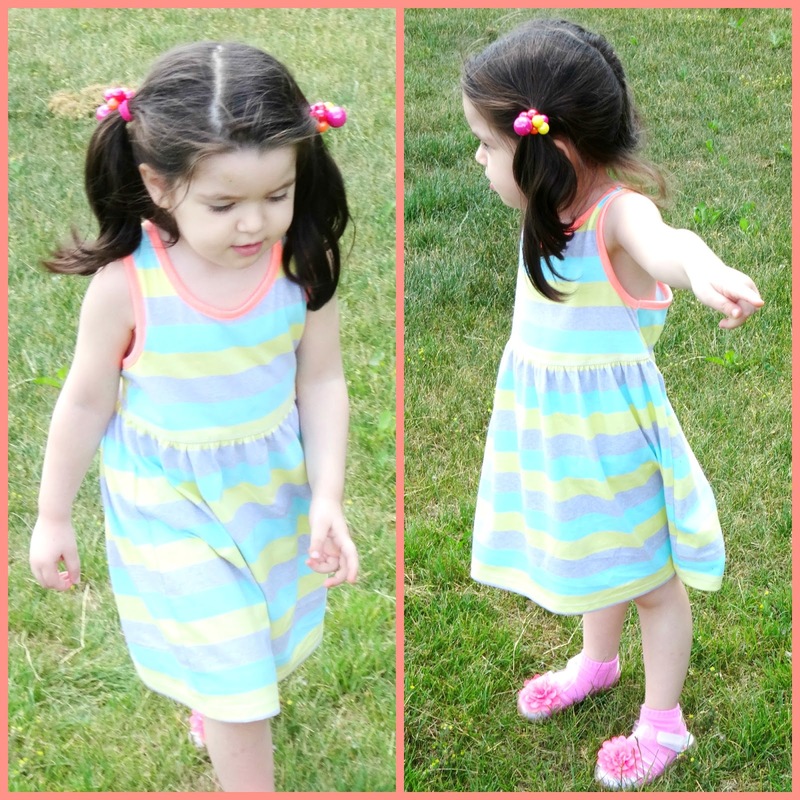 Gray/Mint/Yellow Striped Sundress: Wal Mart (New). Baby Pink Straw Sun Hat w/ Large Cream Bow: A Boutique in Albania (mine). Hot Pink, Purple, Magenta and Yellow Shiny Bauble Ponytail Holders (set of 2): Wal Mart. Neon Pink Cotton Socks: Carter's (New). Strappy Clear Lucite Sandals w Bright Neon Pink Chiffon Flower: Wal Mart (New). Dark Blue Gauze Babydoll Romper w/ White Embroidery: Target (New) (similar, Steal), (similar, Fantastic Deal, love this), (similar in white, Great Deal, my Favorite), (similar w/ red embroidery). Nordstrom's Huge Anniversary Sale is open to everyone today on July 22nd. There are so many great things they have put on sale for Fall. I have shared my Nordstrom sale guide for Home and Beauty products here and my favorites - Dresses - here. Tomorrow I will be sharing some great buys for kids and toddlers from the #NSale. But today since I am wearing a romper, below is a list of favorite rompers and jumpsuits currently on sale at Nordstrom. If money was no object, I would pick up a few. Happy Shopping and enjoy the weekend! Jaymie, Jennie, Jolynne, Karli, Kelly, Lauren, Lisa, Lizzie, Melissa with Sheree + Rachael, Michelle, Monica, Nancy, Osy, Rachel, Rachelle, Rena, Rosie, Sheela, Tara (Socialite), Tiffany, Veronica, Vicki, Whitney Nic and The Wardrobe Stylist. You can still linkup your posts with the latest, newest Thursday Moda Linkup so welcome by.